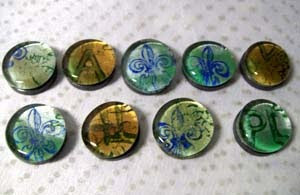 Sometime back I brought home this set of 9 magnets and they 've been sitting on my side table ever since. Today I was thinking I need to start an inventory box for magnets, and then, on second thought, I decided just to go ahead and use them ... NOW. 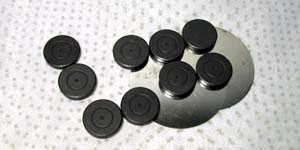 These are really strong magnets and will work great on the refridgerator. 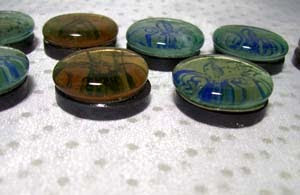 1) Select Glass Gems that are the same size, or slightly larger than your magnets. The globes can be clear or lightly colored, depending upon look you wish to achieve. 2) Select papers or fabrics to show through the glass. 3) Trace your glass globe onto your paper or fabric and cut out inside the tracing line. 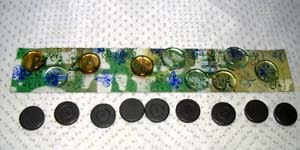 4) Lay out your globes, the magnet and your cutouts, along with your adhesive. I've used clear silicone caulk (my favorite adhesive for non-jewelry). It is not water soluble, goes on white and dries clear. 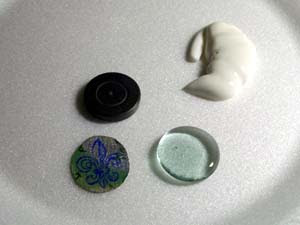 4) Place a thin layer of adhesive on your glass gem. Position your paper or fabric on the gem. Use a brayer, or credit card, and smooth it out. 5) Place a thicker layer of adhesive on the back of the paper and position your magnet. 6) Use a pallet knife, or wide toothpick, and remove any excess adhesive the oozes out the edges. 7) Clean off any excess adhesive from the edges and let it set until dry.